We’ve all had trouble with chainsaws and other power tools that won’t start, especially when we’re using them for the first time. In that moment, there’s no worse feeling than having your saw sputter to a stop while, in front you, enormous branches dangle overhead, or lie there, blocking your path. Whether you’re a first-time chainsaw user or a longtime pro, whether your saw is gas or electric, here’s the guide you need to start your chainsaw on the first try, every time. Afterward, the steps you take to start your gas chainsaw depend on whether you’re starting your saw cold or hot. When you start your chainsaw cold, you’re starting a saw that hasn’t been running. It might be the first time you’ve started your chainsaw that day, or it might be the first time you’ve ever used it. In either case, your goal is to get the fuel flowing and get your saw’s engine warm enough to fire. Without the chain brake applied, a gas saw’s chain will rotate around the bar as soon as its engine starts. Setting the chain brake is one of the most important safety steps you can take. Your engine will start more easily when you provide it with a concentrated burst of fuel. Closing the choke will block air flow, which changes the mixture of air and fuel flowing to the engine to give it that strong blend. 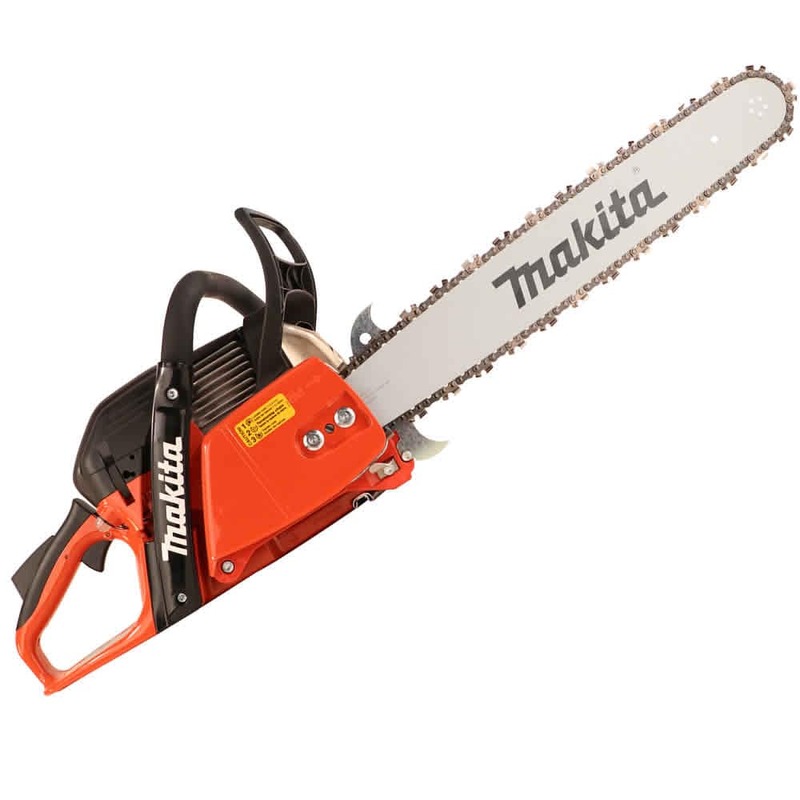 Not all chainsaws feature a decompression valve. If yours does, press it now, as it will reduce pressure in your engine’s combustion chamber and make it easier for your engine to fire. Older saws feature a primer bulb. It sends fuel into your saw’s carburetor, which will then feed the engine the fuel and air it needs to keep running. Four to six pushes on the primer bulb are all your saw requires. On newer saws, you're more likely to find an air purge bulb instead. Pressing this bulb will push excess air out of your fuel lines. Set your saw on the ground, placing one hand on the handlebar and your right foot into the boot grip for stability, and pull the cord slowly until you feel resistance. Then pull firmly and rapidly until the engine fires and you hear a pop or a sound like a cough. This is the sound of the engine trying to start. The engine will not keep running at this point. Trust us—this is perfectly normal. 6. Set the Choke to “Run” or "On"
Moving the choke lever to the “run” or "on" position (the word used varies with the brand of saw) opens the choke but keeps the engine running at high idle. This will add air to the mixture of fuel being fed to the engine so that it can run consistently without being flooded. This time, you might have to pull the starter cord several times until you hear the engine fire. Keep pulling until the saw starts; once it does, it will continue to run. Let the saw run for a minute or so first. This will allow it to reach an ideal warm temperature for use. Then, hit the throttle once and release it to set your engine to low idle. When you’re ready to put your saw to use, simply release the chain brake, and you’ll be good to go! 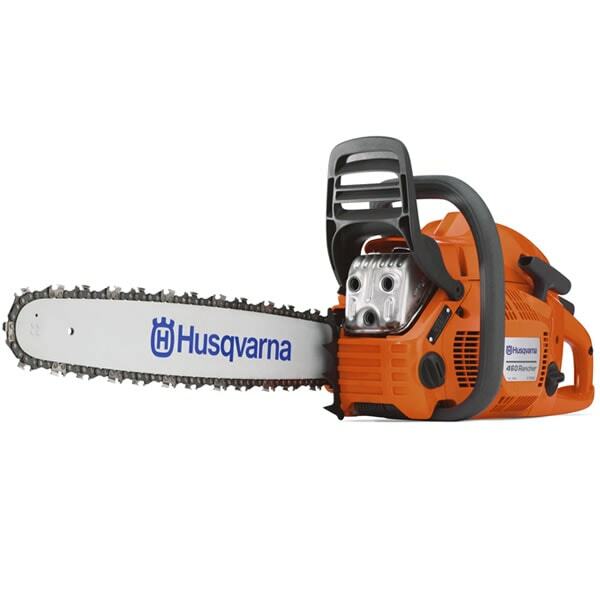 Starting your chainsaw hot means that you’re starting it up again after it was recently used. The engine is still warm, so the spark plug will have less trouble reaching the temperature they need to operate. The biggest difference you’ll notice is that the choke won’t have to remain closed for the engine to fire. It’s a simple step. It’s also an easy step to forget, especially if your saw was in use earlier in the day. Always set the chain brake before starting a gas chainsaw. 2. 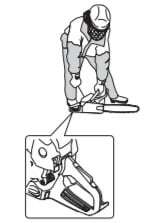 Close the Choke, Then Set It to “Run” or "On"
Because your saw has been running, it’s already had fuel cycled into its carburetor. Closing the choke is what sets your engine to "high idle." Moving the lever to the "run" or "on" position opens the chokes, but keeps the engine at high idle, which will allow the engine to run consistently. Even with a warm saw, pressing the decompression valve is still a helpful step. Doing so will relieve some of the compression that has built up inside of the carburetor. As with a cold start, hold your saw securely on a flat stretch of ground. Pull the starter cord or starter rope until the engine begins to run. With a saw that’s recently been used, you shouldn’t have to run the engine long to warm it up. Simply set it to low idle and disengage the chain brake, and you’ll be ready to cut. One of the advantages of electric chainsaws that beginning chainsaw users particularly like is the minimal effort needed to start them. There’s no throttle to open and no cord to pull, just a couple of buttons to press or squeeze. Unlike the chains on gas chainsaws, which will rotate even when the saw’s engine is idling, the chains on electric saws won’t spin unless you press the trigger. That means that you need to disengage the chain brake on an electric saw in order for it to start and spin. Your chainsaw’s manual might also refer to the safety button by other names, such as the trigger lock or the throttle lockout. Whatever name the manual uses for it, this small button will be found on the side of the rear handle. Because of its location, the best way to press the safety button is with the thumb of the hand that’s holding the saw’s handle. While still pressing the safety button with your thumb, pull the trigger switch with your index finger. Release the safety button and keep squeezing the trigger switch to operate your saw. As easy as electric chainsaws are to start, you might find at some point that your saw's motor stops working or no longer starts. This sometimes happens with electric saws that have brush motors, which use brushes to conduct electricity within the motor. Replacing the motor's brushes will get your electric saw running again. 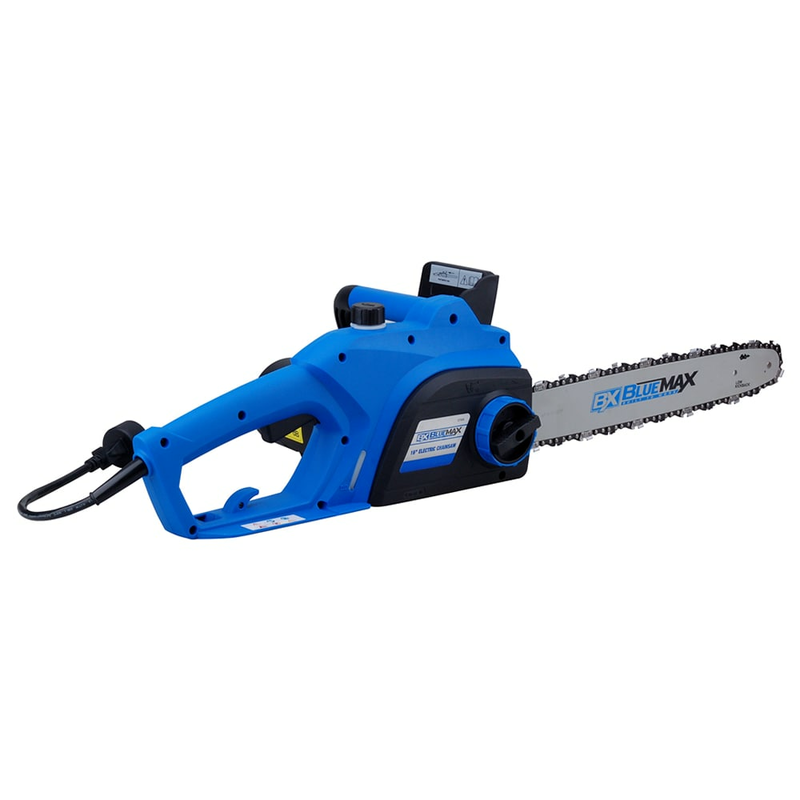 Alternatively, you can look for a saw that uses a brushless motor when you're shopping for a corded electric chainsaw. An electric start chainsaw might sound like the perfect solution to the problems that people have when starting a chainsaw. Who wouldn’t want a handheld tool that provides plenty of power but starts at the touch of a button? 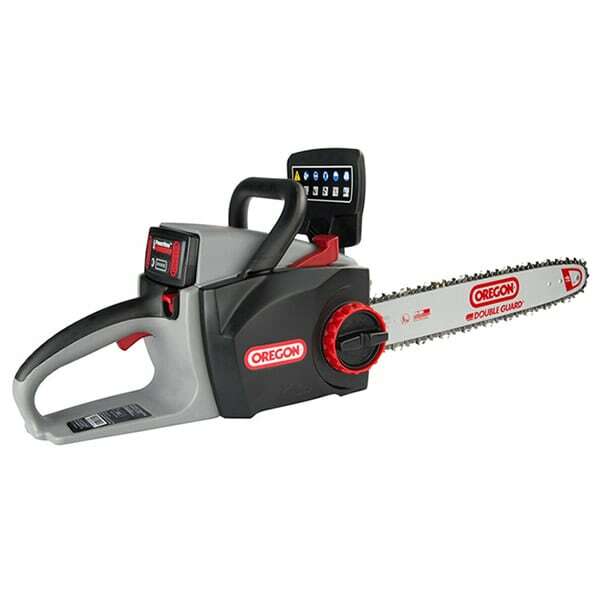 We hate to inform you, but gas chainsaws with automatic electric-start systems don’t exist. The mechanism that keeps the saw running—the gas engine—is the same mechanism that gives it the power to start. A special spring is probably the most common easy-start feature you’ll find on chainsaws. The spring resets the recoil and reduces the resistance you feel when pulling the starter cord. A spring-assisted starting system can reduce the force needed to start a saw by up to 40 percent. Different brands use different techniques to help their spark plugs produce powerful sparks even at low RPMs. Some employ capacitor discharge ignition (CDI) systems, which store an electric charge to help the plugs fire. Makita uses its own Memory Power Ignition (MPI), which allows the ignition coil to fire with fewer revolutions of the flywheel and lower RPMs. Without enough fuel, the saw simply won’t have enough power to start. Too much fuel can eventually flood and clog the engine, but some saws have a mechanism that automatically puts the saw at high idle when the throttle is set all the way up so that the engine has exactly the amount of fuel it needs when it starts. When you’re using a chainsaw, you’re already taking on obstacles: fallen trees, rotten branches, you name it. You don’t need your saw getting in your way as well. A few easy steps are all you need to get your saw started and make a quick end of any cleanup projects in front of you. How to Start a Chainsaw - View Our Tips for Starting Your Gas or Electric Chainsaw. Our chain saw how-to library can help you pick the perfect electric chain saw, gas chain saw, pole saw or chain saw accessory.